I would like to know if it is possible in LINX 5 to cast a string refence of an object to an object. No you cannot directly reference an object by a string value. The main reason is, Linx compiles your solution, and in doing that, a string “List_Output” stays a string, but an Object List_Output becomes a machine reference with a GUID code etc. 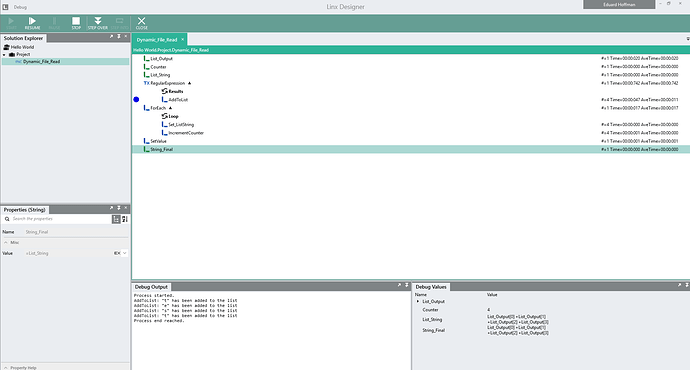 So Linx will no longer know what you are referring to. I wanted to see if you could dynamically read different csv format files. Yes, we have been doing similar reads at clients. You’ll need to design your logic well. What we normally do is, in a Database, list a CSV configuration. Which basically says: Columns Numbers, Names and Rules etc. Then when we read the CSV file, we first read the configuration from the Database, and then read the lines from the file. The file lines then can be Split into a list, using the denominator as the splitter (i.e. “,”) By using the method I showed in the previous post, you can then read through the columns you want. But, like I said, the complex part is the logic of understanding your variations and what you want to do with the data.